These ferns live either wholly or partially submerged. One species is particularly popular among aquarists. The species from this genus most often found on the market, is a true fern and its rhizome must never be buried as it naturally attaches itself to a support (such as a rock, root, or artificial decor). This attachment can be temporarily encouraged by tying the rhizome with nylon line, or wedging it between small stones. It grows slowly and requires normal lighting, water of a moderate density, and a pH of around 7. 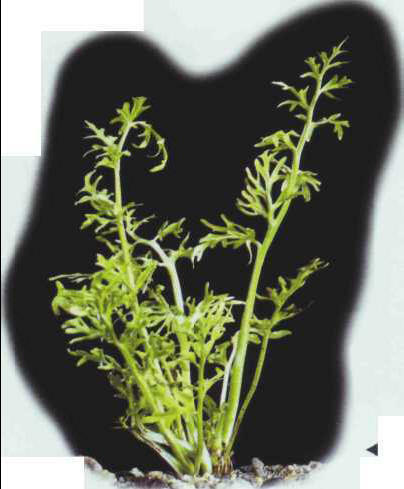 It can be made to reproduce by cutting off the rhizome when new shoots appear. Size: 20-30 cm. 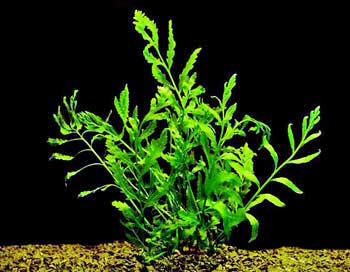 This floating fern makes an ideal shelter for new-born fry, or a support for the bubble nests of the Belontiid family. It grows quickly under strong lighting: when it takes root - which it does with ease - its coloring turns paler and its leaves change shape. The Sumatran fern prefers to be rooted, but it can also survive floating, though its leaves grow thicker. It is a fast-growing, hardy species. Size: 50-60 cm. ЧЕСТЕРТОН (Chesterton) Гилберт Кит (1874-1936) , английский писатель. Один из крупнейших представителей детективной литературы. Рассказы (в т. ч. "Неведение отца Брауна", 1911, "Недоверчивость отца Брауна", 1926), романы ("Наполеон из Ноттингхилла", 1904; "Человек, который был Четвергом", 1908) отличают сюжетная занимательность, эксцентричность, парадоксальность мышления. В основе его социально этической программы - философия томизма (цикл эссе "Ортодоксия", 1908 и другие книги религиозного содержания). Сборник стихов, литературоведческие сочинения (в т. ч. о Ч. Диккенсе, 1906).